Each quarter, the Grace team gets together for lunch as we take a sophisticated analysis of how Grace is performing and what our goals are for the future. 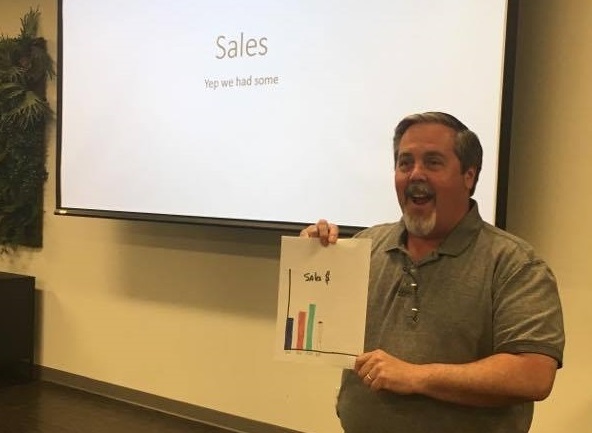 As you can see by the advanced analytical metrics in the above-referenced photo, we're all as excited about this next quarter as Dan is! In all seriousness, we had great conversations from all departments about our individual goals. It is truly rewarding to get together in such a fashion once per quarter to see how our efforts align. So what can you expect from Grace in the foreseeable future? We're calling it the "PESD Blitz". Since I came on board nearly two years ago we have been focusing on launching new products, such as the HSM, VTS, Flex-Mount, Safe-Test Point, & GracePort+ (to name a few!). Now we're going to be shifting our focus to our existing products. Stay tuned for updates from SafeSide® and hit the giveaway at the bottom to win weekly prizes!